Pharrell's been busy! Besides accepting his new role as Daft Punk press secretary, putting out forest fires, and tempering the antics of his little buddy Curious George, Pharrell's also been making a bunch of new music. Not that he was slacking in any way in 2013 — Pharrell was involved with most of the biggest albums of the year. 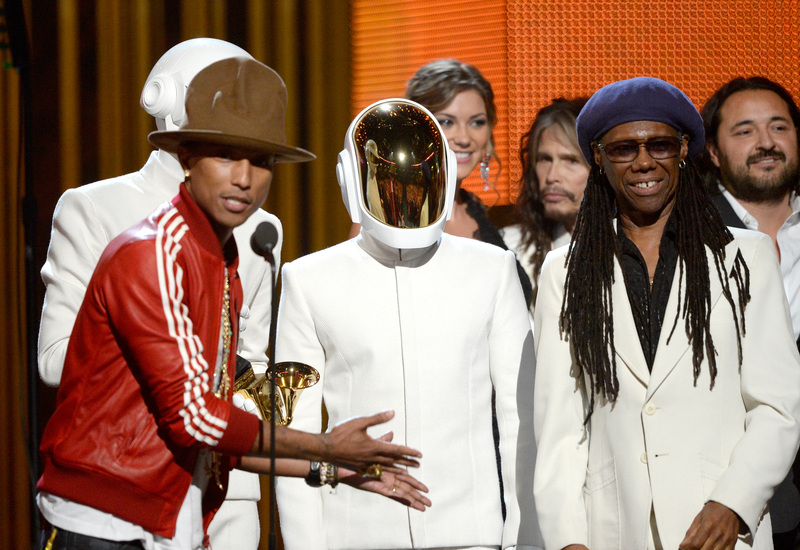 Obviously he was the honorary third member of Daft Punk, providing vocals for "Get Lucky" and "Lose Yourself to Dance" on Random Access Memories. He also starred along with Robin Thicke in his music video for "Blurred Lines," and at one point both "Blurred Lines" and "Get Lucky" were Billboard Number 1 hits. He produced Azaela Bank's album. He was nominated for an Academy Award for his song "Happy" from the Despicable Me 2 soundtrack, and he made a 24-hour music video for the song. He married his hot model girlfriend, and now, in an interview with Complex Magazine, he's previewing some clips of music to come this year. It's unclear whether the songs are Pharrell originals or if he is doing guest vocals on other artists' albums, but what we do know is that he is working with (so far) Usher, TI, and rapper GrandeMarshall. So the only year more about Pharrell than 2013 might be 2014? Basically, Pharrell Williams doesn't have time to look at your crappy memes about his Grammys hat, he's killin' the hustle.